The Target Editor menu options allow you to adjust certain target settings such as score values and size. It also makes it possible to assemble new targets from scratch. Access the Target Editor menu by clicking the Edit icon in the navigation bar. The Target Editor menu has four options: Target Image, Target Size, Zone Settings, and Save Target. The Target Image button opens a dialog window that will load a previously created target image. This is the main target graphic seen by the shooter. DART targets can be saved in different folders inside the DART Data/Targets directory. Once you select a folder by clicking on it, a list of target images contained in the selected folder appears. Once you select a target image, a preview of the target will be displayed. Click the Load button at the bottom of the dialog window to load the selected target image. 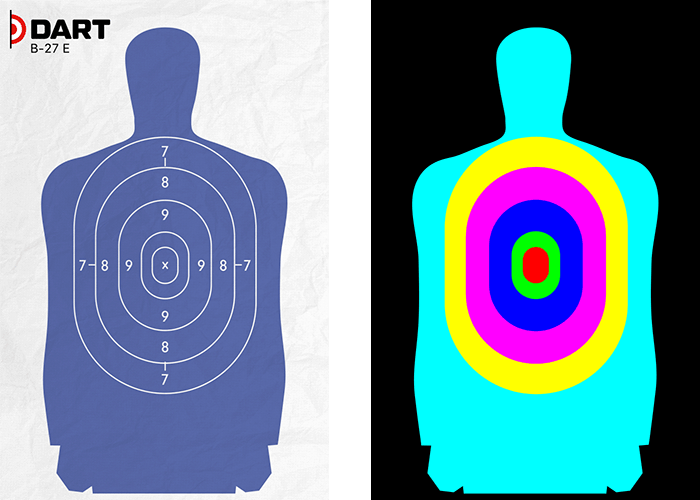 DART uses colored areas called zones to distinguish areas of a target. This allows the system to know the difference between a target’s head and body and allows points to be assigned to different areas of a target. DART targets can have up to eight zones. 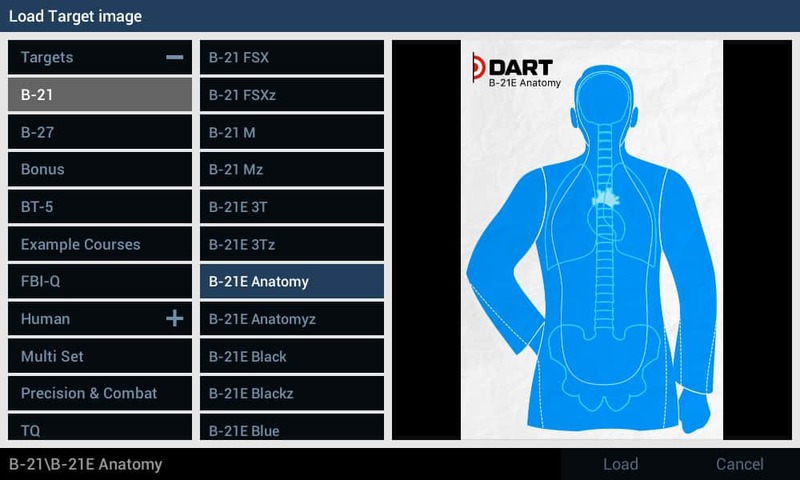 When DART Creator loads a target image, it automatically loads the corresponding zone image which is the name of the target file with a “z” added to the end. For example, if a target’s name is B-21.png, the corresponding zone image would be B-21z.png. Note: Creating a completely new target requires the use of a third-party graphics application like Microsoft Paint, or similar program, to draw the target graphics and zone areas. DART Creator can assemble these images into a finished target. This sets the width and height (in inches) for the currently loaded target. When the Lock option is on, DART Creator will constrain target sizing so that it always remains proportional. The maximum size of a target is 72 inches (6 feet). The Target Settings options set the score value and optional zone hit sound to be played when a particular zone is hit. Sets the point value for the currently selected zone. Point values can vary between -25 and 25 points. Note: In some DART courses, scoring is based on a percentage of hits. Hits are defined as any shot that results in a score of 1 or higher. Every zone can have an audio file assigned to it that will play whenever the zone is hit. This is especially useful when shooting targets at long distances where it becomes impossible to see bullet holes in the target. Clicking the Load Audio button will open a dialog window that will allow you to load a sound. The DART system includes more than 100 sounds and you can add your own by placing a .WAV file inside the DART Data/Audio folder. Once a sound file is loaded, it can be removed by clicking the Remove button. Note: The volume of zone hit audio can be independently adjusted in the DART Range program. DART targets can have up to eight zones, each represented by a colored square. Select a zone by clicking one of the eight colored squares. The selected zone will be outlined in a white frame. Once a zone is selected, you can set the score value for shooting the zone to a positive or negative value using the Zone Point Value slider. Note: Unused zones will have their zone selection boxes grayed out and inactive. Save Target opens a dialog window that allows you to save the current target configuration as a DART target.